I have met and hung out with too many couples to count that have struggled finding color themes/palettes that they felt were unique and fit them well. And if they did see certain colors they liked, they had a hard time trying to figure out if they would look good together. 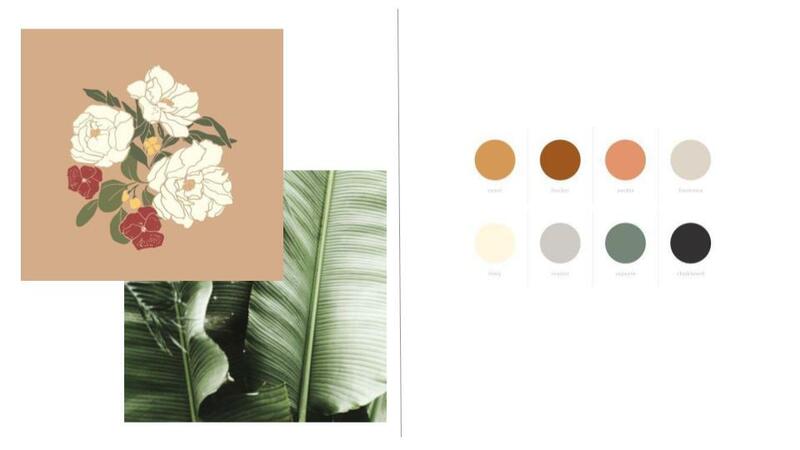 I have decided to start helping my couples, who are struggling with their color palette, by helping them come up with some inspiration for their wedding colors. Colors that would be fun, spunky, and that would truly encapsulate their hearts. This is the first of a series that I will be doing hopefully every other week! This is a recent color inspiration that I came up with one of my brides who is getting married in September! She will be wearing some gold jewelry so she wanted to mix some greens with some warm colors that expressed more of a bohemian feel. If you are bride looking for some help coming up with some color inspiration, feel free to let me know and I would love to help you! When I went to Vancouver in March I had the honor of meeting Kelly White. Kelly is full of sincerity and honesty. She walks in who she is with grace and boldness, in confidence that she is loved by Jesus. Not only is Kelly a wonderful human, but she is a wildly gifted creative. She writes the most moving music that resonates with the deepest parts of my heart. 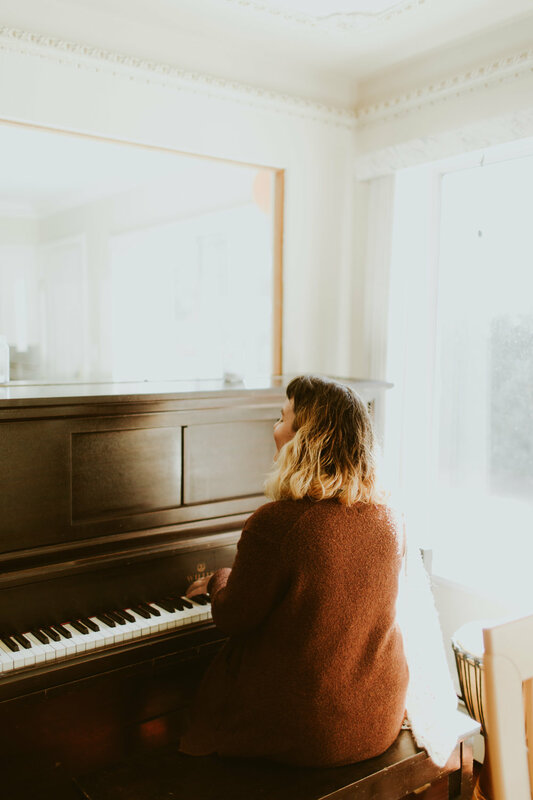 She writes music with such thought and intentionality (check out her music on Spotify) and because of this I asked to feature her on my blog here. Here are her words to my questions and some of my images from our afternoon in Vancouver. X. WHO ARE YOU AND WHERE ARE YOU FROM? My name is Kelly White. I grew up in Sarasota, FL and I am currently living in the humble mountains of Asheville, NC. X. WHAT WAS YOUR CHILDHOOD LIKE AND HOW DID THAT PLAY INTO YOUR LOVE FOR MUSIC AND CREATIVITY? My childhood was a magical imaginative time where I left no creative outlet unexplored. Music stuck especially for me because it both nourished my heart in the times I spent alone as well as ignited connection with others. My family is very musical; my mom and sister both play piano and my dad and brother play guitar. So growing up, music being played in the house was natural. Though as a kid that was quiet and didn’t particularly like asking for attention I chose time in solitude to explore my love for music. It was in the safety of my backyard that I sang my first songs while I would swing under swaying branches. I love to romanticize those memories and to this day I adore swings, because those moments were so formative as I got to dream and say whatever I wanted without any critique from the outside world. Those songs never got written or accompanied with an instrument but I believe that they came purely from my spirit and it is inspiring to me now to write with childlike wonder and imagination. X. WHO OR WHAT INSPIRES YOU MOST AS A CREATIVE AND MUSICIAN? I am inspired most by other artists outside of my medium. To see how other people use their gifts to create something really fires me up and encourages me to do the same. I think often music will reach so many people in personal ways because songwriters have a unique way of expressing themselves in the words they choose, and as listeners we feel like we know them. But, when it comes to other mediums there is a richer commitment to knowing and understanding the art someone creates. For me knowing photographers personally or even just studying about painters gives me a finer admiration for others’ perspectives and abilities to highlight beauty or bring light to darkness in the world. All art is always in conversation with one another, and I hope my music engages in the conversation. X. WHAT HAS BEEN YOUR BIGGEST ROADBLOCK AS A CREATIVE? Me. My biggest fear is rejection and although my music’s purpose isn’t to lift myself up I still want to be authentic in how I present myself. In doing so and singing songs that expose intimate parts of me I feel so incredibly vulnerable to the thoughts of others. But to preserve myself would defeat the power of my music. So with all of these feelings I often put an intense pressure on myself that no one could ever live up to, so the easier option for me would be to hide or run away. For years I have battled stage fright and insecurities about whether or not I am enough, but at the end of the day I know I have strong convictions and valuable things to say so it would be more selfish of me to keep that to myself. X. WHAT IS YOUR HEART FOR YOUR MUSIC( aka what do you desire for people to experience when they listen)? I don’t want to be categorized as a “Christian Artist” but I wouldn’t serve my songs well if I pretended that I am not a person of faith. My worldview is the lens in which I understand what goes on around me and it saturates the themes of my songs, while still being accessible to all people despite their personal beliefs. With that in mind I want to break down some of the confining structures of religion and society that have caused us shame and affirm others that ultimately they are valued and loved. By inviting other people into my journey, I wish for my songs to inspire hope and healing in others. X. DO YOU FEEL MOST CREATIVE AND INSPIRED IN THE MORNING LIGHT, AFTERNOON, OR GOLDEN EVENINGS? I feel most inspired in the morning light. I love the quiet and calm of the morning and the possibility of the day. I don’t often have this mind sight but when I do wake up and recognize the sun’s rising - which, I was never promised to receive - I become full of gratitude. It both gives me the courage to let what tore me down the previous day die with the night as well as accept and delight in the little treasures of the golden morning. X. HAVE YOU TAKEN THE ENNEAGRAM? IF SO, WHAT IS YOUR PERSONALITY TYPE AND HOW DOES THAT COME OUT IN YOUR ART? I am an Enneagram 4w5. I am the individualist and romantic with just enough rationality to keep me grounded but also torment my inner world - I’m being dramatic, but like I said I am a 4. As a 4 I have constructed an identity for myself that I feel is secure, and it’s difficult for me when anything poses a threat to that identity - making performing a hard route to take. As much as I love being unique, just like anyone I want to belong. But what I’ve learned through creating music is that it is better that I try to say things differently or oppose the status quo of what music could and should be. Though lonely and often feeling like I lack support because I don’t desire to follow the trends that gain attention, I think the support I do have is genuine and deep. I also think my personality has given me a real eye for finding beauty in pain and loss, which connects with people in very powerful ways that are honestly beyond me. That concept alone has been so helpful for me to get outside of my self-absorbed 4 ways and allow who I am to be a part of a community and building others up with music.